RPGWatch Forums » Games » General Non-RPG » Command & Conquer - Remastered Editions? Command & Conquer - Remastered Editions? Seems EA keeps sucking the corpse dry and is remastering the Command & Conquer franchise once again. This time it's for the franchise's 25th Anniversary. Will be hard to deal with the old cutscenes though, as redoing them would probably be worse than just keeping them. Me to but I don't think much of EA nowadays. To much focus on MP games. A remaster of the older games was released a few years back before Command & Conquer 3 & Red Alert 3. It was called the First Decade Edition and I hated it. They left the cut-scenes as they were, and barely made any new enhancements to the older games. So hopefully EA does a better job this time. At this point I have doubts. Last edited by Couchpotato; October 12th, 2018 at 00:59. These games were pure joy back in the day, but I wouldn't touch a damn thing that Electronic Arts has been involved in. Principles and such will having me steering very clear of their products! The first decade was not a remaster, it was just a re-release of the games in one package, with some minor compatibility tweaks to make them run well in XP. Still a piece of crap though hardly any work was done. Entering all the serial numbers to activate and install was a hassle also. Nowadays they sell a Ultimate Edition with every game together. Anyway I don't think EA will invest a lot of money to redo graphics, and the movies. If they do I'll be surprised. Also to get a few of the older games to work on Win 10 takes some tweaking, and third party files. Heck I cant even get Generals to work on Win 10 and I tried everything. Last edited by Couchpotato; October 12th, 2018 at 15:42. Never said the Ultimate edition was remastered. Please read my full reply. I just mentioned this is how the games are now sold on Origin, and that EA wont spend a huge amount of money to remaster these games. So don't except much. As much as I love these games the last few did not sell well on release. Command & Conquer 4 was a mobile game made for the PC, and the latest is a mobile game. Last edited by Couchpotato; October 12th, 2018 at 15:56. I know that you said that C&C: Ultimate Collection was not a remaster, just The Last Decade, but the reason why I mentioned remastering in my post is because the situation would be very different with a re-master, compared to a re-release, as far as compatibility with a modern OS & hardware goes. I don't see the relevance with mentioning a re-release released for Win 7 not running well in Win 10 has to do with a remaster, where they'll be able to do major changes to the games & their engines. These are two things so different from each other that one really has very little relevance to the other. Yes and once again like I said don't except much as it EA. As a full remaster for Win10 would take years and a big budget. On a side note maybe one day we could see a new Dune game but I doubt it as that IP is dead. Anyway look were just going in circles here so I'm out. Have a nice day. I actually recently replayed C&C 1, 2 and 3. They're still good, but getting them to work is quite a hassle at times. The editions that are currently available via Origin should not be confused with what GOG does when they release a game. These are no better than the old CD and DVD versions. I actually wouldn't mind getting re-masters, or just updates that actually work, but I'm not holding my breath here. We're likely to get very little, but for a high price. Seems the new GUI for the remasters will be like C&C 3. Also no micro-transactions for the remasters according To EA. That is: Cash Grab & Ignorance. Another great video about the whole series. Quick update Petroglyph Games is doing the remasters. Also they said the remastered version of the first two games will be 4K; not sure if they will actually redo all the graphics or just scale them - however since the original devs are working on them maybe they will actually tweak the games and they will actually be good. Of course this is EA so I suspect origin only for pc. Yeah they will probably require Origin to play that I have no doubt of. After this announcement my interest has returned as a few of the older games need a facelift. Maybe I can finally replay Generals as Win 10 hates it, and wont load it. No release date yet though. So probably 2019-2020. If they actually do a proper job with the remasters, I'll likely get them. Love those games. 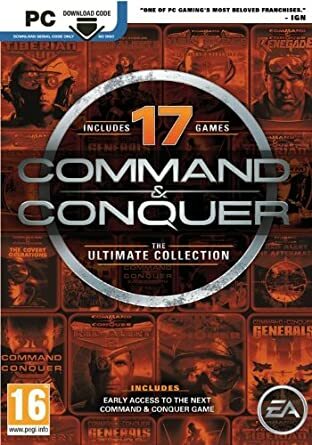 Speaking of Command & Conquer, can anyone tell me if the "Command & Conquer: The Ultimate Collection" properly runs in Windows 7 64 bit? Last edited by henriquejr; November 16th, 2018 at 19:01. The last three that I didn't list have no problem running on Win 7&10. As for the ones above you many need to find other programs to run them and increase resolution. Last edited by Couchpotato; November 17th, 2018 at 02:58.